Sliced cheese on a table. 3 How Many Calories in One Piece of American Cheese? American cheese slices are processed cheeses that are available in a variety of colors--orange, yellow or white. American cheese is a versatile, popular addition to side dishes, sandwiches or hamburgers. Each slice of American cheese supplies vitamins, minerals and calories broken down between fat, carbohydrates and protein. The content of calories and vitamins varies based on the brand and serving size. 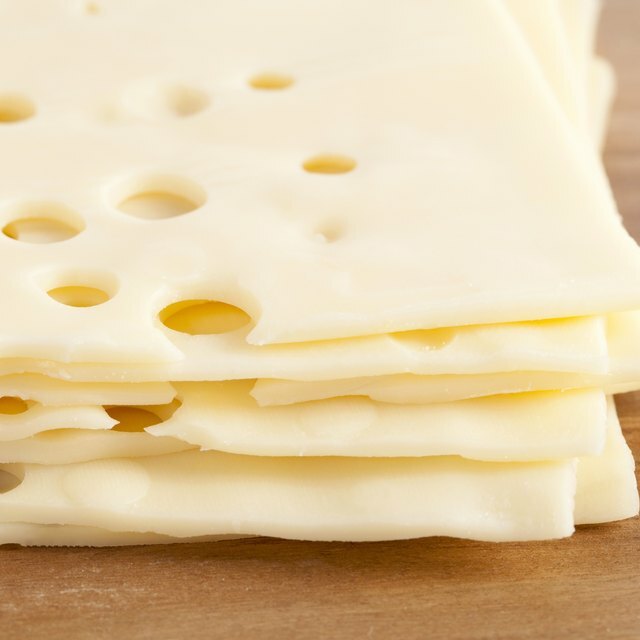 Most American cheese slices come in a serving size from 16 to 28 grams. There are 60 calories in a 16 gram serving and 94 calories in a 28 gram serving. The calories are distributed between fat, carbohydrates and protein. Fat typically provides 45 to 67 percent of the calories, protein provides 12 to 20 percent and carbohydrates provides 3 to 7 percent. Fat content in a slice of American cheese varies based on the milk used to make the cheese. Low--fat and skim milk produce cheese that contains a lower amount of fat than whole milk. In a 19 gram serving, there are 4.5 grams of total fat which accounts for 7 percent of the recommended daily value. American cheese is considered high in saturated fat, with 2.5 grams of the total fat coming from saturated fat. 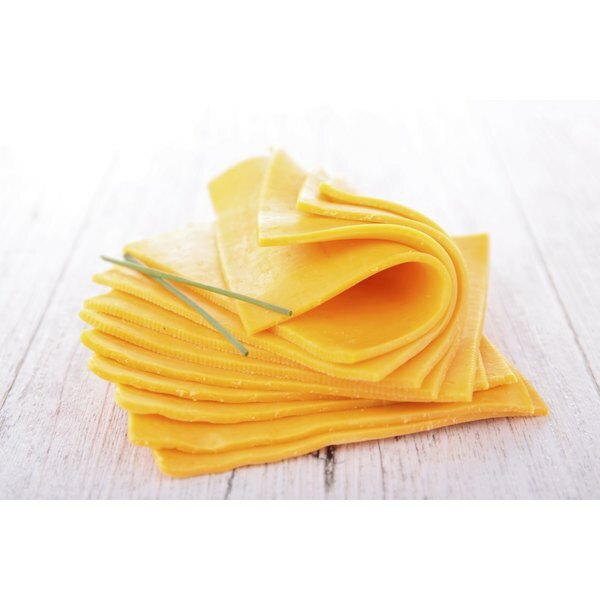 American cheese slices provide small amounts of protein and are not considered to be a significant source of protein. A 19 gram serving of cheese provides about 3 grams of protein. This accounts for about 12 calories and provides 6 percent of the DV. One of the positives of American cheese slices is the low amount of sugar, with total carbohydrates typically around 1 gram. However, with the absence of carbohydrates, American cheese doesn't provide any dietary fiber. Vitamins and minerals aren't plentiful in slices of American cheese. The few that are present, however, are in significant amounts. About 10 to 20 percent of the DV of calcium--important for bone health--is found in a 16 to 19 gram serving. Vitamin A and sodium provide 4 and 11 percent of the DV, respectively.